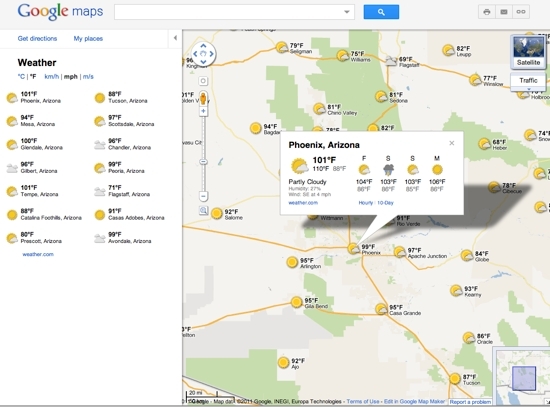 Weather in Google Maps? Natch! Is there nothing Google Maps can’t do? Now we’ve got a weather layer in Google Maps that will probably end up replacing the need for things like Weather.gov or even NOAA. Given the budget issues in Washington, why not outsource the Weather Service to Google? While they are at it, why not the Postal Service (Why does every U.S. government entitity end in “service”?) to Google Mail? Seriously though, after the coffee shop example, is there a better GIS mapping demo than weather?